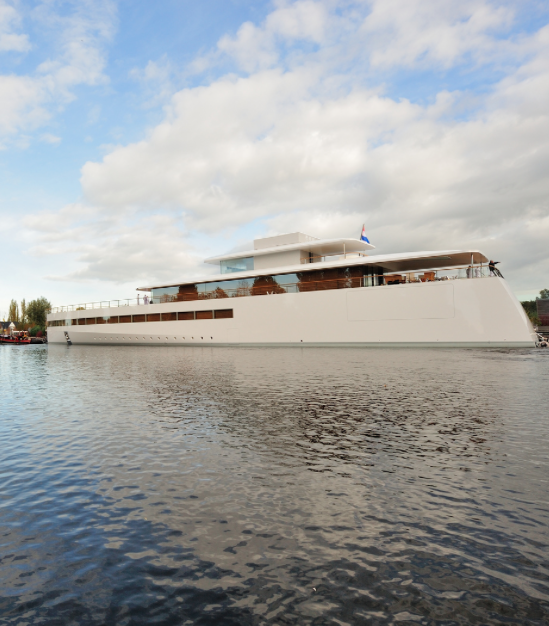 About a year post the passing of the great entrepreneur/tech inventor, Steven P Jobs, the Apple founder's yacht, Venus is finally finished. The luxury water mansion spans about 230 - 26o feet long, and apparently the design concept had been a collaboration between the designer, Phillippe Starck and Jobs himself. Jobs known (as many of the most successful entrepreneurs in Silicon Valley), for showing distaste for being gaudy when it comes to money, did splurge on two international vehicles: a private plane that's equally designed as this beautiful yacht, (see video featured above via One Last Thing). Similar to the designs of the Apple stores, the Venus has floor to ceiling glass windows, is partially made up of the same aluminum material in Apples devices, and is powered by multiple Apple devices to control the premises.